In 1968, after the Vietnamese village of Ben Tre was demolished by the US military, a US Army officer infamously said, “It became necessary to destroy the town to save it.” Recently President Obama reminded me of this famous lesson in Orwellian logic while explaining his decision to break his promise to stop the deportation crisis by taking executive action at the end of the summer. According to the president’s logic, the best way to keep immigrant families together is to continue the deportations for another two months. The idea that immigration reform will be better off if it’s delayed, and immigrant families are made to suffer longer, has not been well received. Latino and immigrant communities, which could see up to 60,000 families torn apart in the coming months, are outraged. 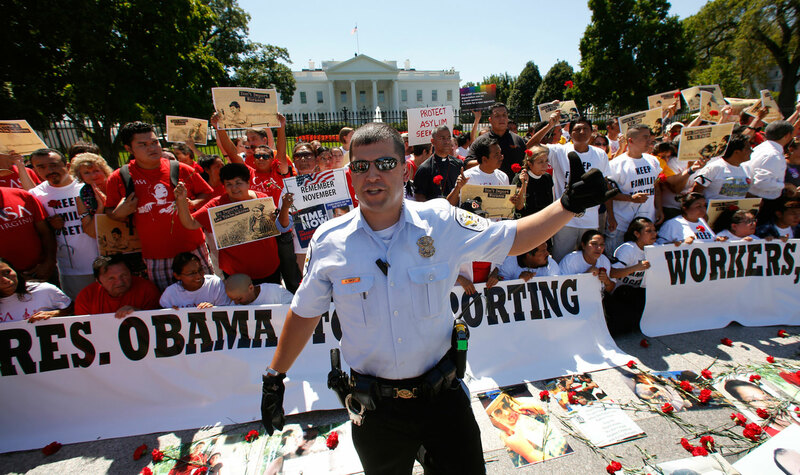 The new deportations will come on top of some 2 million since 2008, the largest number in US history. While a delay of two months may not seem like much to a politician, it is everything to the child who will lose his or her parents in that time. Americans are used to the political decisions made by presidents at least being spun as somehow based on a judgment about good public policy, but the president did not bother to hide his cold calculation that family well-being would have to be sacrificed to the political needs of the Democratic Party. And it’s not even clear that Democrats will reap the promised political gains by avoiding an immigration debate in election season: Republicans lost no time declaring their intention to savage Democrats on the proposed executive action. Thus Democrats in swing states will neither avoid the charge of “amnesty” nor benefit from the enthusiasm that would have greeted bold leadership. The president deserves the bulk of the blame for prolonging rather than ending the suffering. But squeamish Democratic senators, including some who have immigrant voters to thank for their presence in the Senate, clearly begged him to do it. They have cynically reasoned that the 2014 election map does not include many places where the immigrant and Latino vote will likely be decisive—and, in any event, that those voters will have nowhere to go after the Republicans revert to appeasing their anti-immigrant, anti-brown base. Democrats running for their lives in Colorado, Florida, Illinois and elsewhere may come to regret this political arithmetic when their erstwhile Latino supporters stay home. The sad irony is that immigration reform is simply inevitable. No Republican or Democrat is likely to win the presidency in 2016 without appealing to the fastest-growing voting bloc in America. The movement for reform at the grassroots was strong and ready to be ignited in support of courageous presidential leadership. Americans by huge margins support immigration reform and are tired of the gridlock in Washington. A president and party willing to aggressively debate Republicans on the merits of reform almost certainly would win. Unfortunately, courage did not rule the day, and thousands of kids will lose their moms and dads to forced separations. Yet the real power of our movement is in the voices of these very families—and they will not linger long in anger and disappointment. Immigrant families are already responding to this lack of leadership with a brave and fierce determination to win their struggle. While bitter, this setback must not and will not have a disempowering effect on a movement that is marching toward certain victory.